The Anne Collins Weight Loss Program offers (at this time) 9 diet plans in the form of eBooks when you sign up for a one-year membership at the modest cost of under $US20. Anne Collins, nutritionist and weight-loss expert with over 20 years experience, is the principal behind the website that operates this widely-recognized program. 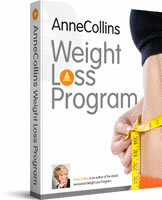 As of January 2012 The Anne Collins Diet isn’t available. We recommend I Love This Diet instead. The program offers members access to any or all of the 9 complete Diet Plans summarized below, membership of Anne’s On-line Forum, 365-day email support, 600+ pages of weight loss information, motivation advice articles, etc. Rapid weight-loss which maintains stable blood-sugar levels, or for those with particular health problems (obesity, type 2 diabetes, insulin resistance or PCOS – Polycystic Ovarian Syndrome, a common hormonal reproductive problem in women). 28-day diet plan for optimum blood glucose control and weight loss, combines lean protein with low glycemic carbs to help stabilize blood-sugar and reduce hunger. Includes a complete eating plan for every day with calories in every food item, plus over 60 quick & easy recipes, and a shopping list for each week. Has many food-substitutes (for picky eaters), fast-food options, and ‘mix-and-match’ applies to everything. Meal plans average 1100 calories per day, which may be increased to 2000+ calories (depending on gender and weight-loss goals) by adding calorie-controlled snacks from a wide range included. Adaptable for dieters of any weight. Healthy low-carb eating for fast weight loss. Healthy 28-day low carb diet plan with a meal planner that provides for each day, 3 tasty low-carb meals (from over 40 easy recipes) and 3 snacks (from a large range) – includes carb weights for every meal and calories in every food item. Has many food-substitutes (for picky eaters), fast-food advice, and a full list of snacks as well as a shopping list. 2 Phases: Phase 1 (14-days) average of 30g carbs per day- Phase 2 (14-days) average of 55g carbs per day. Lose up to 4.5Kg/10 pounds in first 2 weeks. After 4 weeks, continue losing weight by repeating the diet, or switch to another plan. Achieve a quick weight-loss breakthrough if you’ve stalled or have a short-term weight-loss objective. 14-day eating plan with six meals/snacks a day for fast metabolism. Includes two 14-day menu plans with recipes for mainly quick home-cook and mainly convenience-meal/fast-food options – mix & match as desired. Meal plans list calories in every food item, and average 1000 calories per day to maximize weight loss. Has many food-substitutes (for picky eaters), fast-food options, and a full list of snacks as well as a shopping list. Takes two weeks, after which you may switch to another diet in the program to continue losing weight. Rapid weight-loss in a healthy, flexible plan. Offers a well-balanced 28-day eating plan for healthy weight loss, including menus for 28 days. Each lunch and dinner includes a home-cook and a convenience-meal option (including a range of fast-food choices and take-to-work meals). Meal plans average 1100 calories per day, which may be increased to 2000+ calories (depending on gender and weight-loss goals) by adding calorie-controlled snacks from a wide range included, and by using fast-food options. Adaptable for dieters of any weight. Reduce cholesterol while rapidly reducing weight, or simply use as a very healthy diet. well as a shopping list for each week. by adding calorie-controlled snacks from a wide range. 2-3 weeks after starting, and over time may fall to 30-55 mg/dl. in the program to continue losing weight. A ‘rapid weight-loss’ diet plan for those who enjoy vegetarian food or want to cut out or reduce meat consumption. 28-day straightforward balanced weight loss plan for vegetarians (and others) who consume milk and eggs. Meal plans provide about 1250 calories per day, which may be increased to 2000+ calories (depending on gender and weight-loss goals) by adding calorie-controlled snacks from a wide range included. Calories are given for every food item used. Has over 90 easy recipes, quick recipes for soups and dips, plus advice on cooking grains and vegetarian fast-food options. Includes many food-substitutes (for picky eaters), and a full list of snacks and a shopping list for each week, as well as advice on diet nutrition and weight issues. After four weeks, weight loss may be continued by repeating the diet plan, or switch to the Vegetarian Diet for Life plan. A vegetarian diet plan to gradually achieve your ‘normal’ weight, that helps you to learn about healthy vegetarian eating. Intended to be a lifelong balanced vegetarian diet plan; low in fat-content, moderate in protein, and designed to normalize your weight by slow and steady weight reduction rather than quick weight-loss. There is a choice of easy breakfasts, lunches, main meals and desserts – plus snacks. Contains a suggested 14-day menu for starters, with advice on how to cook grains, legumes, rice, pasta, pizza, potatoes and tortillas. Meal plans provide about 1250 calories per day, which may be increased to 2000+ calories (depending on gender and weight-loss goals) by adding calorie-controlled snacks from a wide range included. Calories are given for every food item used. The diet contains a wide choice of easily-prepared foods, such as the main meal section of over 100 dishes with foods like: Bread, Potatoes, Rice, Pasta, (Tortillas, Tacos) Cereal, Fruit, Fruit Juices, Smoothies, Vegetables, Beans, Legumes, Low Fat Dairy Products, Low Fat Ice-Cream, Mousses, Yogurt, Frozen Yogurt and more. Includes information on fat, calories and cholesterol, and guidelines for a sensible eating lifestyle. Fast weight-loss with a flexible eating plan for those with little time to cook. 28-day plan with a complete set of menus for super-fast meal preparation for all 28 days. Lunches have fast-food, take-to-work and quick-cook options. Dinners have options for fast-food, quick-cook, and 2-day meals (meals lasting over 2 days). Meal plans provide about 1100 calories per day, which may be increased to 2000+ calories (depending on gender and weight-loss goals) by adding calorie-controlled snacks and fast-food options from a wide range included. Calories are given for every meal, and the plan includes food-substitutes (for picky eaters). After 4 weeks, repeat the diet plan for continued weight loss, or switch to another plan. A lifelong balanced diet plan to achieve and maintain your ‘normal’ weight, that helps you to learn about healthy eating. Low in fat-content, moderate in protein, plenty of carbs and designed to normalize your weight by slow and steady weight reduction rather than quick weight-loss. Includes a suggested 14-day starter menu with a choice of easy breakfasts, lunches, main meals and desserts – plus snacks. Also includes advice on fat, calories and cholesterol, plus guidelines for sensible lifelong eating habits. Meal plans provide about 1300 calories per day, which may be increased to 2000+ calories (depending on gender and weight-loss goals) by adding calorie-controlled snacks. This diet plan can be continued indefinitely, or change to another plan. Breakfast: Pancakes, Bacon & Berries2 ‘lite’ pancakes , 1 tbsp maple syrup, 2 slices Canadian bacon, ½ cup berries. Dinner: Convenience Option: Frozen Meal – Angel Hair Pasta(or calorie-equivalent)Lean Cuisine Angel Hair Pasta (220 calories), 2 cups salad, 1 tbsp fat-free dressing, 2 graham crackers with 1 tbsp fat-free cream cheese, 1 serving fruit. Anne Collins Weight Loss Programs, in conjunction with the information and support available through the official website, teaches good eating habits and gives excellent and personalized motivational advice. She does not sell supplements, bars or shakes, and the low-key emphasis on exercise in the programs is bolstered with information on the website. These programs are very popular and by all accounts quite effective, and represent good value for money. I’ve tried her diet and it was really good I’ve lost 15 pounds so far and I am so happy . Agree with Whimsy. Tried Anne Collins diet and it was NOT worth the money. With time I discovered that 99% of her website was copied from the USDA and FDA sites. My advice is to save your money. All you get for your money are menus telling you what to eat, not always practical or based on what you like or what you have on hand, and message boards. You can get better support from the free site http://www.sparkpeople.com. I know; I’ve tried both, and Anne Collins was NOT worth the money, even though it’s not a large outlay. Save your money and try http://www.sparkpeople.com you even get a free menu/meal planner that you can custoize, unlike Anne Collins.